Calculating The Essence Number (Numerology Lesson 27) | Law of Attraction Plus: The Secret revealed! Essence numbers are complex calculations (so bear with us!) that are used to describe important transits in an individuals life. Essence numbers describe dominant demanding influences or what seems to permeate the general atmosphere throughout a number of years. The interpretations define what is most in need of attention or focus during that numbered year. This method of calculating transits begins at birth with the first letter of your birth name, the first letter of your middle name and the first letter of your last name. These values are totaled and define the Essence of your year from birth to age 1. We then go on to calculate the Essence of each year of the life. The best way to learn this method is to jump right into it so here is the worksheet you will be using. Keep in mind this work sheet can extend for as many years as you want it to or just a period of years.... It depends on what period of a person's life you want to examine. Notice that in the above example that you could extend for as many years in the past or the future as you want (just not before birth.) Usually a professional would expand this chart to span 70 or 80 years or he or she would isolate just a few years that a client specifically wanted a reading about. You could a span of 70 years if you like but for the purpose of this example we have only done four to show you what the Essences chart that you will be doing your calculations in should look like. 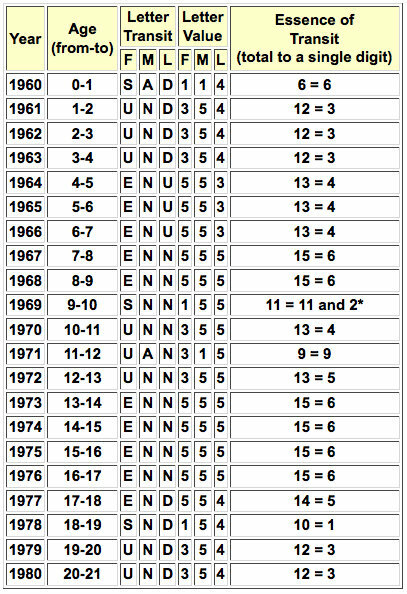 Year: Start with the year of birth and calculate the timing as if the year begins on the birthday (not January 1). Age: Start with the age at from birth and then fill it in as you go down. Begin with 0-1, then 1-2, and so on. 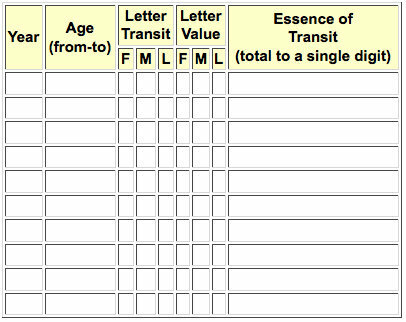 Letter Transits: Insert the letters of the first name under the letter F, middle name under M, and last name under L. Repeat the letters of name as explained here. 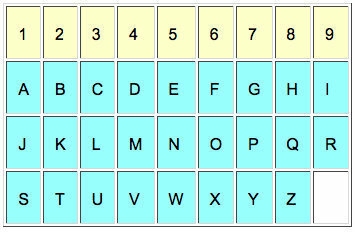 Letter Values: Insert the numeric value of the numbers in the letter transit. Essence of Transit: To come up with the total add the numeric value of the numbers in the letter transit together and then reduce them to a single digit. You must place the letters of your name on this worksheet. Begin with the first letter of your first name. Each letter in this name will last a number of years (from 1 to 9) depending on its numerology number designation. In the interest of keeping this lesson short and sweet let's use a very simple name for this example: Sue Ann Dunn and lets say she was born in 1960 and we want to do a chart for her from birth to age 20. Thus, if the first name is Sue we would note that the first letter S it is valued at 1 year. This would be placed under the F (for First Name) column for one year. Next we notice that the value of U is 3. U would be filled in under the F column for the next 3 years. This would be followed by the value for E, which is five years. When the end of the name is reached you then start repeating the cycle at S.
You would then repeat the same process for the Middle (Ann) and Last name (Dunn), finding the number values and using their value to find the length of the transit and also their numerological value. * Notice that values that add up 11 and 22 will have two interpretations - ones for the master numbers and ones for 2 and 4. You next step would be to evaluate the chart by examining the interpretations for each number and then looking at the total values and seeing how long these influences last in a person's chart. 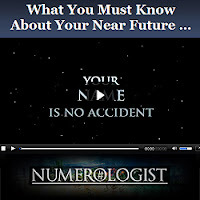 In the next newsletter you will be receiving the basic interpretations for the Life Essence numbers. Then in the newsletter after that we will come back to this short fictional chart to show you how to identify major periods of transformation in a Life Essences Chart. I don't understand how the first transit letter changes...your name never changes...Rosemary McRae, born on12-14-63. Please assist me with this matter. Many thanks!